(Nanowerk News) Graphene—carbon formed into sheets a single atom thick—now appears to be a promising base material for capturing hydrogen, according to recent research ("Gas Adsorption Properties of Graphene-Oxide-Frameworks and Nanoporous Benzene-Boronic Acid Polymers") at the National Institute of Standards and Technology (NIST) and the University of Pennsylvania. The findings suggest stacks of graphene layers could potentially store hydrogen safely for use in fuel cells and other applications. Graphene has become something of a celebrity material in recent years due to its conductive, thermal and optical properties, which could make it useful in a range of sensors and semiconductor devices. The material does not store hydrogen well in its original form, according to a team of scientists studying it at the NIST Center for Neutron Research. But if oxidized graphene sheets are stacked atop one another like the decks of a multilevel parking lot, connected by molecules that both link the layers to one another and maintain space between them, the resulting graphene-oxide framework (GOF) can accumulate hydrogen in greater quantities. 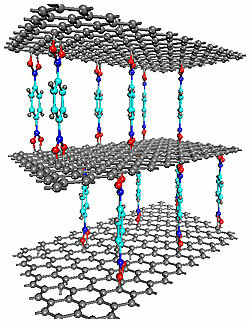 A graphene-oxide framework (GOF), formed of layers of graphene connected by boron-carboxylic 'pillars'. GOFs such as this one are just beginning to be explored as a potential storage medium for hydrogen and other gases. The GOFs can retain 1 percent of their weight in hydrogen at a temperature of 77 degrees Kelvin and ordinary atmospheric pressure—roughly comparable to the 1.2 percent that some well-studied metal-organic frameworks can hold, Yildirim says. Another of the team’s potentially useful discoveries is the unusual relationship that GOFs exhibit between temperature and hydrogen absorption. In most storage materials, the lower the temperature, the more hydrogen uptake normally occurs. However, the team discovered that GOFs behave quite differently. Although a GOF can absorb hydrogen, it does not take in significant amounts at below 50 Kelvin (-223 degrees Celsius). Moreover, it does not release any hydrogen below this “blocking temperature”—suggesting that, with further research, GOFs might be used both to store hydrogen and to release it when it is needed, a fundamental requirement in fuel cell applications. Some of the GOFs’ capabilities are due to the linking molecules themselves. The molecules the team used are all benzene-boronic acids that interact strongly with hydrogen in their own right. But by keeping several angstroms of space between the graphene layers—akin to the way pillars hold up a ceiling—they also increase the available surface area of each layer, giving it more spots for the hydrogen to latch on.